I love you Destiny, I love you not…. I started off a proponent for Bungie’s newest edition to their family. Sure, they were quick (10 years) to toss off their allegiances to the Microsoft family and their Halo children. It’s understandable. 343 was quick to pick up the reigns and break the Master Chief Collection. I was, however, a little apprehensive when they signed a 10 year agreement with Activision as a publisher for their next game/dynasty. Activision publishes World of Warcraft, and spams us with Call of Duty games afterall. But Bungie is a company of bright people, so I had faith. This new agreement turned into a new brand: Destiny. Destiny is to be something huge, something epic. 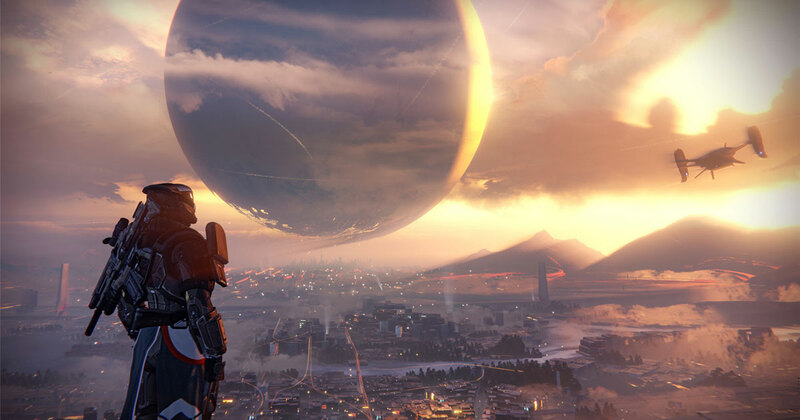 Destiny is something to change the gaming landscape. And maybe, fingers crossed, become another household name, like Halo. What we have right now is a First Person Multiplayer Shooter, or “shared-world shooter”, with its gameplay not unlike its Halo predecessors, but with an online community to support it. What we got was, arguably, not a lot, but with the promise of more to come, and early talks of sequels already. Bungie and Activision are promising a 10 year life cycle for Destiny, whatever it is, or will be. These partners have invested a lot of time and money and effort into this project and only time will tell if it truly pays off. Financially, it’s already paid off, but when you ask for people’s opinions of the game, you’ll find mixed responses. I’m not of negative opinions towards Destiny, I don’t intend to waste time saying off-putting things about games in general. I play games that I like, and I stop playing, and quickly forget about those I don’t like. I could go into details about the shortcomings of Destiny’s story, its lack of any real narrative or backstory. How there’s maybe 3 cutscenes, and the rest is fed through unenthused voice-work and text on the screen while the game loads the upcoming mission. This uncommitted, unwillingness resembles the first time you meet the Speaker, the Voice of the Traveler, Earth’s savior, and now deteriorating squatter. Wait…what? Ok, start over. Destiny is to be something huge, something epic. 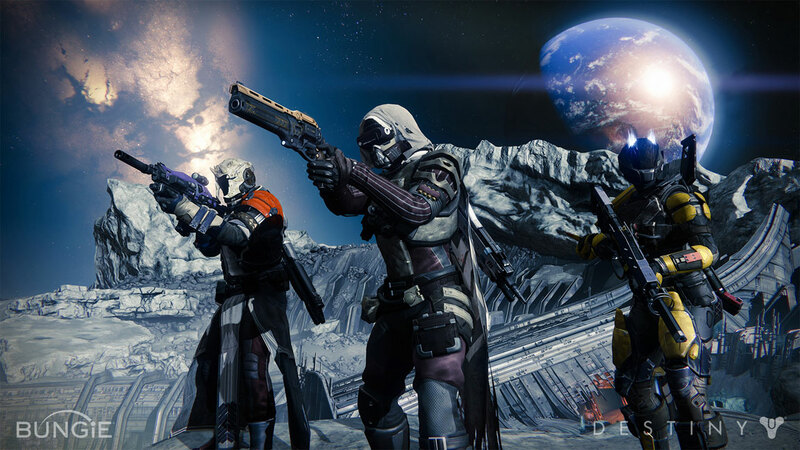 Destiny is something to change the gaming landscape. We play the game as a Guardian, with the choice of 1 of 3 races: Humans, Awoken, and Exo. 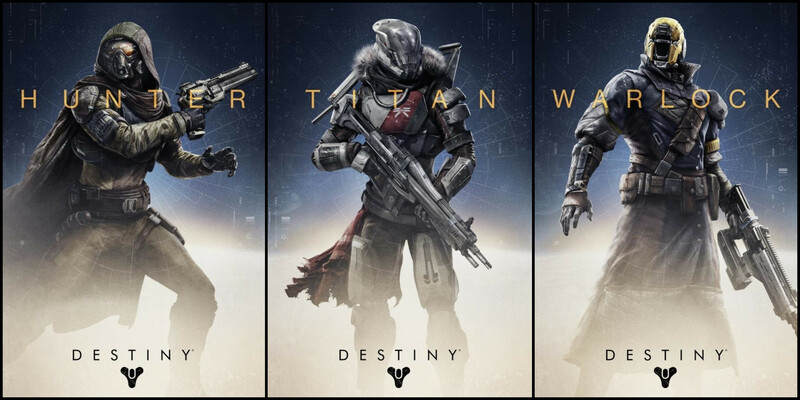 We are also given the choice of 3 classes: Titan, Warlock, and Hunter. Who are these races? What’s their story? You’re guess is as good as mine. What we DO know is that The Guardians are the last defenders of humanity, of the last safe city on Earth after the Collapse. Earth was, at one point, very prosperous and advanced. The humans were able to spread out and colonize planets in our Solar System. The Collapse came about and dissolved all of these efforts and nearly brought mankind to extinction. The only humans left were saved by the Traveler, a giant spherical celestial body, or ship, or entity, who had arrived centuries earlier, and who was responsible for Earth original prosperity. Mankind again strived for growth and repopulation of the Solar System, but the Traveler is dying, and there are threatening alien races occupying the System’s previously terra-formed planets. As a Guardian, we are tasked with investigating and eliminating the Darkness, that, which ails the Traveler, and destroying the encroaching alien threats before humanity is wiped out. As intimated, we have 3 class choices, each having 2 sub-class traits. The Titan is the brute of the trio, relying more on armour, and melee abilities. The Titan’s Striker subclass allows the player to release a huge ground smash, killing anything within its range. The Titan’s Defender subclass can provide a protective spherical shield to the group. The Titan is equipped with a jetpack , allowing access to higher elevations which may lead to some truly epic ground smash moments – if one was so inclined. Up next is the Warlock, which can be looked on as the tank/support of the three. Warlocks focus on regaining their health and shields quickly. The Warlocks Voidwalker subclass has the player throw a large Nova Bomb that detonates on impact. The Sunsinger subclass increases all the player’s abilities dramatically for a short time, and reduces all cool downs. When spec’d high enough, they can also revive themselves after death. Warlocks have the ability to glide for a short time to scope out an area or line up the Nova Bomb. Finally, the Hunter is Destiny’s scout. Quick, and agile, and focused on a quicker combat style. The Hunter’s Golden Gun subclass provides the player with just that, a Golden Gun, for a short burst, and only 3 rounds. Hunters are also equipped with a throwing knife for melee, and the Bladedancer subclasses focuses on a charged blade. Bladedancers can also utilize an invisibility perk. Destiny’s gameplay, as previously mentioned, is of the FPS genre, but with a Role-Playing MMO feel. We’re equipped with the basics: a primary, secondary, and heavy gun, grenades, and hover bike. We also have to manage 5 types of armour. Complying with RPG expectations, we have an inventory to store our guns and gear that we pickup, and each weapon and piece of armour has experience and perks. Our subclass of choice also levels up and unlocks new perks, and attribute tweaks as we progress. These perks and characteristics allow the player to adjust their Guardian to their preferred play-style. So, the familiar Halo game mechanics are there. The game’s features worlds on Earth, the Guardian Tower on Earth (Destiny‘s online hub), the Moon, Venus and Mars. Reportedly more planets to come with expansions and sequels, but these are what we have now. There are a handful of story missions, one or two Strike missions and a Patrol Mission, per planet. Strikes are like the boss missions, and Patrols give you access to the planet to do as you see fit, and maybe partake in a few fetch quests. The structure is thus: story missions can be played alone or in a Fireteam made up of 3 friends. These missions are also shared online, so you’ll see other Guardians running around killing the same enemy respawn groups you’re fighting. Certain portions of the mission get closed off to just your Guardian or Fireteam. These are essentially the dungeons of the game, with the promise of focused firefights and possible loot drops. The Strike mission is dedicated to the Boss fights. They’re a lengthier mission, higher chances of pick-ups, and experience upon completion. These mission are mandatory 3 player excursions. Patrol is last, and essentially self-explanatory. Solo or in a group, you have free reign of the planet to mine for kills, loot, collectables, or partake in fetch quests. Again, it’s another “shared” mission, so you’ll see other Guardians running around. So the familiar Halo game mechanics are there, there’s even a personal hover bike to get you around the large levels. The game is very pretty, and I believe this is where Bungie truly shines. Their world creation is nearly unmatched, and the attention to detail is literally seen on the moss covered walls, the sides of structures decayed after decades of wind, where the other face’s side is unblemished, or even the sand slowly floating off the dune tips on Mars. These planets showcase the civilizations that’ve been there, whether it be the remains of the past human colonies, or the recent alien inhabitants. The design shows age, decay, overgrowth and neglect. We’re not told what happened; only that something happened. We’re shown the remains of colonies past, but not encouraged to look any deeper, or ask questions, just look upon it and wonder and reflect. There are sights and vistas to marvel at, but save for the structures, there’s no history, no evidence of life. This is how fan fiction is written. Now, at this point, with maybe 8 to 10 hours invested, cracks in this game’s gorgeous exterior start to show. The leveling aspect and the dark role-playing grime start to show teeth. Your character’s max experience level is 20. You’ll reach this in 8 hours by just playing the story. Level 20 is when you get access to the Tower’s goodies. These goods are still kept out of reach, where the vendors that sell their armour and weapons all require you to meet certain requirements. These demands are met by endlessly playing the same story missions, and Strikes, and fetch quests, and multiplayer PvP matches, over and over. To level beyond 20, you must acquire newer armour with an attribute called Light. Found through drops if you’re lucky, but to buy the legendary gears will require time and perseverance. Accessing the game’s first Raid requires a level 26 character. The time and patience to tolerate this tedium will not be for everyone, and the scope isn’t fully explained to begin with. The game at this point takes on a life of its own, and becomes something entirely different. “So you’ve beat the story missions? That’s great!”, it proclaims. “The darkness still loom”. Come back and play the same tired missions some more. There’s weekly and daily showcased Strikes. Come play with friends at the Heroic difficulty if you dare. You might get something cool. Or come and play for hours in the PvP arena to rake up enough experience and points to buy a gun or a helmet off this vendor. Some can tolerate this. Some might not have known what they were getting into when they purchased Destiny. Some might ask why the grinding is necessary and level 26 is a requirement to access the Raid. Maybe the layered murkiness is there to confuse us, keep us returning, showing a little more at a time, until the next expansion is released. Maybe I’ll continue to play this game with friends, in the spirit of fun. I don’t anticipate reaching level 26 or accessing the Raid. Maybe the DLC will change things for those out there like me, behind the curve, looking for the Light. I won’t know. Why invest in two pricey expansions, further supporting a game that didn’t have the sufficient content to justify the initial buy-in? For those who like Halo, and repetitious acts in futility. This entry was posted in Reviews and tagged Bungie, Destiny, Grinding, Guardian, Halo, Raid, review, Strike. Bookmark the permalink.